Been diving in South West Rock? Please Vote! Situated 13km southwest of Koh Tao, South West Rock is also widely acclaimed as another of the Gulf’s premier diving destinations, with depths ranging from 30m upwards. The series of seven pinnacles form an underwater mountain range, with the largest peak rising to within 5m of the surface. Like Chumphon Pinnacle, S.W Pinnacle features a carpet of anemones on the upper levels, with an abundance of whip corals and large sea fans arrayed along the lower edges of the site. Impressive Barracuda over a meter in length can be seen patiently waiting whilst tiny Cleaning Wrasse perform their underwater valet service. To the southeast of the main site lies a smaller pinnacle, which is home to two resident, if somewhat shy Leopard sharks. Huge, powerful groupers live in the site’s caves and canyons, and in season privileged divers can share the clear, deep blue waters with the visiting Manta Rays and Whale sharks! 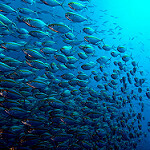 The site has no shortage of smaller occupants, with impressive schools of Snapper, Emperor fish and Sweet lips. Also known as South West pinnacle, this dive site is a colorful underwater garden lcoated among pinnacles forming an underwater mountain. 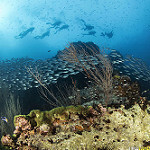 Schools of blackspotted snappers along big huge groupers inhabit this dive spot as well as some leopard sharks. Cleaner shrimps are hiding in the cracks of the rock. Map of Koh Tao, South West Rock dive site.